Classic Monsters House of Frankenstein (1944) Ultimate Guide - Boris & Glenn! 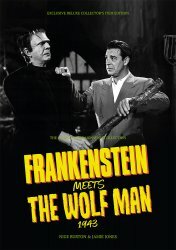 MyMovieMonsters.com > Monster Magazine Marketplace > Classic Monsters Of The Movies (UK) > Ultimate Guides > Classic Monsters House of Frankenstein (1944) Ultimate Guide - Boris & Glenn! 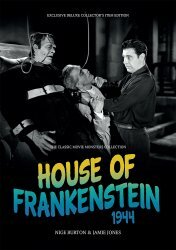 Direct to MyMovieMonsters.com from the creators of Classic Monsters of the Movies magazine in the UK: The House of Frankenstein Ultimate Guide has the luxury feel of the brochure you might have bought at the cinema in 1944! We ship same or next day so don't wait for the UK! House of Frankenstein continued the parallel stories of Larry Talbot and the Frankenstein Monster in an unforgettable extravaganza of thrills and horror. A new roster of characters, from the callous Dr Niemann to tortured hunchback Daniel and his beloved Ilonka, brought fresh intrigue to the ongoing monster saga, with Dracula himself casting a sinister shadow across proceedings as well. Classic Monsters celebrates this action-packed movie with a new Ultimate Guide to House of Frankenstein. Capturing the twists and turns of this beloved motion picture through glorious full colour design and crisp movie stills, this magazine guide is the ideal way to explore Visaria all over again. An exploration of the movie's production is just the beginning, as you'll find cast and crew biographies, behind the scenes trivia, and much more, all sumptuously illustrated with stills, posters and artwork. The Frankenstein ruins are frozen over but this magazine guide to House of Frankenstein is one hot prospect. While supplies last we also offer issues of Classic Monsters of the Movies magazine, additional Ultimate Guides, The Monsters Day-By-Day Almanac, Scrapbook, and the Dreaming of Nightmares Crash Course in Horror Movie History guide. Want this Ultimate Guide as well as the Frankenstein Meets the Wolf Man Guide? Use the handy Buy Both button below!